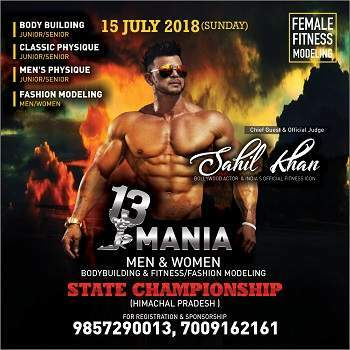 Event Details: GYM13 invites you for our 3rd Mr. & Miss Himachal 2018 Body Building & Fitness/Fashion Modeling Event (Male & Female) aiming strongly on Drug Free Himachal, Drug Free Youth as our main motive i.e. 13Mania Mr. & Miss. Himachal 2018. Based on overwhelming & marvelous response received to our last year event this year the event will be even more happening and better than 2017. The event is scheduled once again in the capital of H.P. i.e. 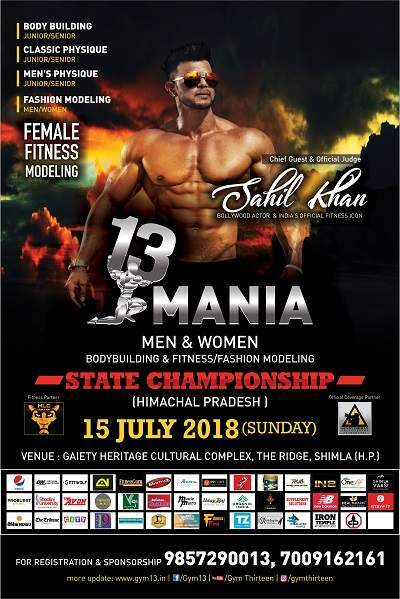 Shimla well known as Queens of Hills on 15th July-2018. (Sunday) at The Gaiety Theatre, Mall Road, Shimla (H.P) A heritage & beautiful auditorium of its own kind. GYM13 Youngest and the fastest growing gym chain started from a small town Rampur Bsr. in H.P. is now a registered trademark across the country. With continues trust & support of youth of H.P. backed up by their parents GYM13 has able to expand its growing wings to another state i.e. Punjab. GYM13 Started from H.P. now in Chandigarh (Pb.) has been able to bring wave of fitness & healthy lifestyle.